Most greyhounds can live with cats BUT the process of detraining a greyhound takes time and patience and should not be entered into lightly. 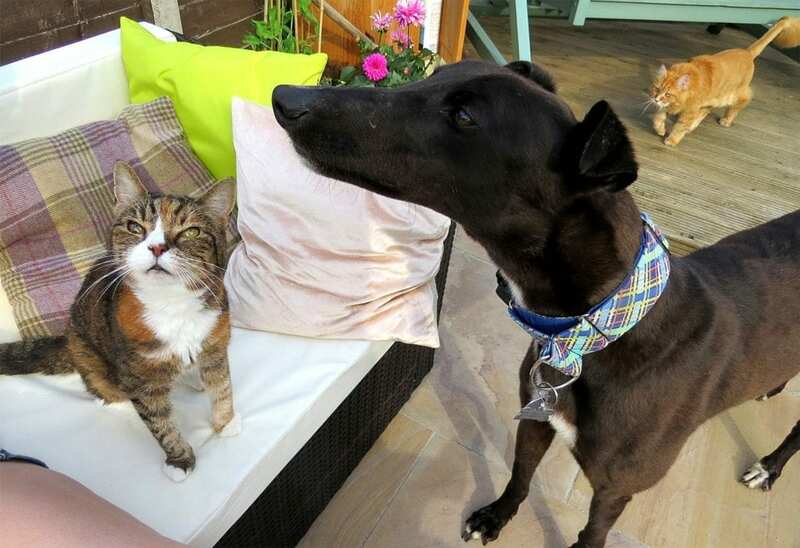 Above all it takes confidence from the new owners – your new greyhound will probably get very excited at meeting your cat but you need to keep calm and be in control of the situation. You will probably have a few restless nights, your stress levels will increase for a few days and there may be times when you think it will not work – but just remember, once everything has settled down, it will all be worth it. 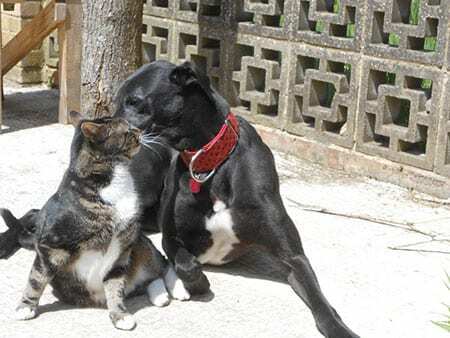 It is not just greyhounds that chase cats – most dogs need careful introductions. We only cat test the greyhounds to see which we think they will be suitable to live with cats – we do not cat train them for you. You will need to put in the time and effort once you have adopted your new greyhound to make sure all animals can live happily together. If the dog is suitable for training we will note him as cat workable on his rehoming advert. Very rarely we do get a dog that has lived in a home with cats – his rehoming advert will say cat friendly. You will also have to be comfortable with using a crate/indoor kennel or the whole process may not work. Please be aware that the dog may object strongly to be placed in a crate so you have to be strong and not give in to the tantrum – you need to make the crate really appealing to your dog so decides he wants to be inside it – but you will have to be patient whilst he makes that decision. This is a short term issue which will benefit the whole family in the long run but you need to stay firm. For the above reasons we do not rehome to families with both children and cats as in the past dogs have been returned because either the family didn’t have the time to train the dog properly, the children did not fully understand the importance of keeping the dog (or cat) in the crate, or the children were upset if the dog barked at the cats. Make sure the cat is indoors before you go to collect your new dog. If your cat is nervous you may need to plan to keep the cat indoors for around 2 weeks, so you will also to think about litter trays etc. Keeping your cat indoors also ensures that he cannot take offence and go to find a new home next door. Before collecting your new greyhound you should make a comfortable and appealing den for him, inside a crate. This needs to be set up in the room that the family uses the most. The crate allows everyone to keep calm in the first few days, so you are less stressed, your greyhound is less stressed and your cat cannot come to any harm. If we have a crate available at the time of adoption we are happy to let you lend it for a few weeks on the understanding that it will be your responsibility to collect and then return the crate. We only have a limited supply, so we cannot guarantee we will have one available. We do ask for a deposit of £50 to ensure that the crate is returned to kennels after use. The deposit will be returned to you as soon as the crate is returned to KGR. On arriving home with your new hound, ensure that he is muzzled, has a correctly fitting collar and is on a strong lead. 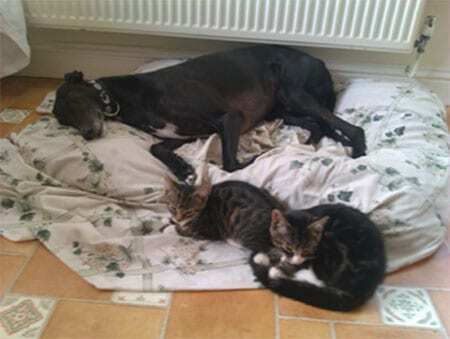 Be confident – your greyhound will be wearing a muzzle so the cat is protected should you accidentally drop the lead. Your greyhound will sense if you are nervous or worried – so remain calm and confident at all times. Introduce your new dog to the cat. 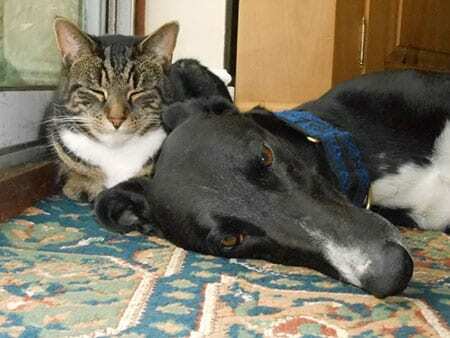 If the greyhound gets excited and lunges for the cat – say NO and mean NO. At this point you need to be very firm so your new hound knows it is not acceptable to chase the cat. Once he stops reward him with a tasty treat and lots of fuss. Remember to allow your cat to be in charge – a good smack from the cat always helps and will serve as a reminder to the hound not to mess with the cat. Never stop the cat from trying to be the boss. Try to keep the dog and cat and the rest of your family in the same room for as much time as possible, so the dog realises the cat is part of the family and gradually looses interest in the cat. After the initial meeting keep either the dog or the cat in the crate – but allow the one not crated to go up to the crate and meet the other animal. 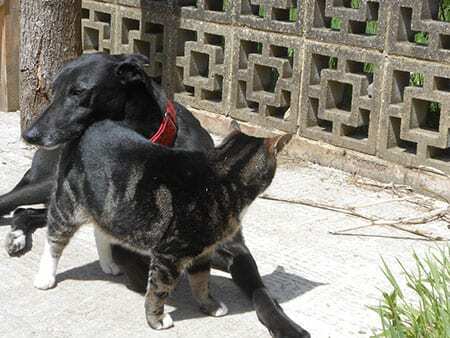 The more your dog and cat get used to each other – the quicker the process will be. If you keep them apart, the training will take much longer. Gradually let the dog out of the crate when you are in the room, and get him used to the cat. At this point you can take off the muzzle, but keep the dog on a lead. Always correct bad behaviour with a firm NO and good behaviour with a tasty treat. Never allow your dog and cat to be alone in the same room until you are 100% sure they have accepted each other. Even when you are 100%, only leave them for very short periods, in a place where you can keep an eye on them and intervene if necessary. Don’t be worried if you don’t see an improvement within a few days. The whole process can take 2-3 weeks for any signs it is going to work and 2-3 months before you can be sure.